Eight wines have tied in first place in a tasting of single vineyard Napa Cabernets from the 2008 vintage. Thirty Napa Valley winemakers and retailers gathered at The Culinary Institute of America at Greystone in St Helena, California to assess single vineyard Napa Valley Cabernet Sauvignon wines from the 2008 vintage. The reviewers are part of the St. Helena Star and Napa Valley Vintners Tasting Panel, an ongoing collaboration between the Napa Valley’s long-time local newspaper and the region’s non-profit trade association. The panelists, all local winemakers and key trade, meet monthly to review current vintages or varietals produced in Napa Valley. Lest you believe the winemakers in the group are full of instant praise for their appellation’s wines, you’d need only to step inside a tasting to see the truth. Critiquing wine is second nature to those who produce it, and these Napa Valley winemakers are quick on the draw, pointing out any imbalances or style affects which do not meet with their approval. With the purpose of assessing the quality of the region’s single-vineyard Cabernets at the most recent meeting, panelists tasted through six different flights of six wines each for a total of 36 wines. Each flight is rated from first (best) to sixth place. All wines are tasted blind and only revealed after a discussion on the wines’ merits or misgivings. The tasting was by no means a snub at blended wines. Some of Napa Valley’s finest wines are blends of different vineyard sites, often combining characteristics from cooler growing sites with those from warmer areas to produce a certain flavor profile or structural balance. Single Vineyard wines do hold some cache among American consumers, however. 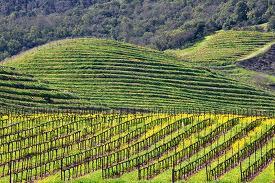 They generally showcase a special vineyard site, and let people taste an expression of that vineyard.